Originally published in the Journal de Montréal on April 12, 2014. Of all the exotic fruits that grocery stores are selling with increasing frequency nowadays, rambutan is probably one of the oddest, due to the rather long and curved fibrous growths that cover it, giving it the appearance of a “hairy lychee”. 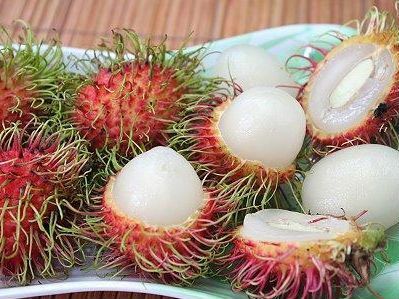 The name “rambutan” is derived in fact from the Malay word “rambut” meaning “hair”. This fruit belongs to the same family as the lychee, and they both have the same delicate flavour and translucent, juicy and fragrant flesh. Like the lychee, it is rich in vitamin C.
Native to Indonesia and Malaysia, rambutan is grown all over Southeast Asia, the Philippines and the Caribbean. Always select fruits with bright red skin. Green spots on the fruit mean that it is still unripe, while brown-coloured “hairs” mean that the fruit is overripe and less palatable.